Knowing what you need to know is hard. Sometimes harder than the learning itself. Many years ago I was getting started with .NET v1 and .NET unit testing, Agile had recently been “invented” and I had a printout of the agile manifesto on the office wall. I was also learning Test Driven Development (TDD), mocking, unit testing frameworks, assertions, data driven testing. I remember it being a little overwhelming at times, so much to learn with fragments of information scattered around but no clearly defined path to follow to get where I knew I wanted to be: proficient and efficient in writing high quality, tested and testable code. Today things are a little easier but there can still be the: “I don’t know what I need to know”. This is where skills paths from Pluralsight can be super helpful. I wish I had had them all those years ago. A path is a curated collection of courses in a specific order to get you to where you need to be for a specific learning goal. I’m super proud to have contributed to the C# Unit Testing with NUnit Pluralsight path which at the time of writing you can start to watch for free with a Pluralsight free trial. While it’s certainly possible that you could find the information and learn the topics yourself, you would also waste so much time in getting the information from disparate sources and trying to “meta learn” what it is you don’t know. Ultimately it depends on how much free time you have and how efficient you want to be at learning. You should always keep the end goal in mind and weigh up the costs/benefits/risks of the different ways of getting to that goal. If you want to learn to “how to write clean, testable code, all the way from writing your first test to mocking out dependencies to developing a pragmatic suite of unit tests for your application” then the C# Unit Testing with NUnit path may be your most efficient approach to get to your goal. Whilst I’m not personally a fan of New Year’s Resolutions, preferring instead to adopt a mindset of continuous improvement, the end of a calendar year is as good a time as any to do a 12 month retrospective and think about the future. Below are a number of resources you may find helpful to make 2019 your best year yet, along with some of the things I’m currently learning/implementing in my quest for personal development. Discipline Equals Freedom: Field Manual (Jocko Willink). Learn to understand that discipline in the present gives you more freedom in the future. The Inner Game of Tennis (W. Timothy Gallwey). More about physical development/performance but the ideas transcend into anything you want to learn. Man's Search for Meaning (Viktor E. Frankl). Harrowing account of Nazi concentration camps infused with what it means to have real meaning in your life. Principles: Life and Work (Ray Dalio). Ray Dalio is the founder of one of the biggest and highest performing hedge funds in the world, this book shows the life and work principles the author has developed and also introduces the fascinating idea that you can run your life based on a set of your own written down principles. Extreme Ownership: How U.S. Navy SEALs Lead and Win (Jocko Willink & Leif Babin). This should be required reading for anyone managing/leading other people, and for anyone wanting to feel like they are more in control of their life by not making excuses. Jocko Podcast. Leadership, discipline, inspiration, service. Mind Pump Media Podcast. Fitness, health, weight lifting, entertainment. Ben Greenfield Fitness Podcast. Health, wellness, spirituality, self quantification, living your best life. Early to bed, early to rise (somewhere between 4:30 AM and 6AM – not sure yet) Effectively swapping some mindless TV/YouTube/XBox gaming at night for productive time in the morning. Generally: reducing waste, simplification, balanced minimalism in regards to ownership of things, saving/investing more money, reading more, learning more. I hope the preceding things prove to be useful, inspirational, or interesting to you. I wish you all the best for the coming year and hope that your 2019 brings you closer to being able to live your best life. Someone says to you: "you must be doing agile, continuous integration, continuous deployment, automated testing, test driven development, etc. etc. etc. or you're doing it wrong". For any sufficiently complex application you’re building it's likely that the above things, and more, will be beneficial. The problem is if you’re not doing any of these things and you feel overwhelmed where do you start? You start where you're at. If you feel overwhelmed this may be a useful acronym to help you start where you're at. Accepting where you are now and starting where you're at can help remove negative feelings and the feeling of being overwhelmed and not being "good enough" at your job. This of course doesn't mean that you should accept unprofessional practices and not try to improve things, it simply means acknowledging without judgement where you are now and then moving forward to improve things for the future. You can start with the "big rocks", the more important or foundational things such as making sure you're using adequate source control. Maybe then move to implementing a basic continuous integration build. Maybe then start to add some automated tests, etc. etc. Do things incrementally and build on each success with subsequent success. To create the change you desire, you may have to invest in you along the way, develop an understanding that discipline equal freedom, and also ask yourself the question “what would easy be like?”. One of the books I read this year was Discipline Equals Freedom: Field Manual by Jocko Willink. The overarching concept in the book is that if you have discipline now, in the present, this will result in greater freedom in the future. This could be having the discipline to work out/lift weights; in the future this will most likely result in the freedom to move more with less pain/lift heavy things/go trekking/kayaking on holiday, etc. This could be having the financial discipline to regularly save/invest money rather that spend everything you earn; in the future this will most likely result in having the freedom to (semi)retire early, not have to work in a job you don't like, etc. I think the reason this book resonated with me personally is that it helped focus the outlook I already had on investing in the future/thinking longer term. This concept can also be applied to software development. Disciplined software development now, will most probably lead to greater freedom in the future to make changes or add new features. As an example, having the discipline to create automated tests can help give you the freedom in the future to make changes without having to perform a load of manual testing or worry about what may have broken unknowingly. Another example: having the discipline to refactor code as you are working on the current feature/bug to keep the code as clean as possible will most probably give you the freedom to change it more easily in the future. If you are a manager: having the discipline to allocate time for you team to train/learn/get better even when faced with pressure to deliver will most probably result in the freedom to deliver more in the future. The concept can also be applied to non-coding practices such as having the discipline to hold a stand up meeting every day, engage business/users/stakeholders regularly, etc. You can also flip this concept on its head and instead ask: in the future, what aspects would I like more freedom in: in one month, in one year, in 10 years? Let the answers to this question guide you when deciding on what it is you need to be more disciplined on today or this week to make manifest those desired freedoms in the future. In business/personal coaching there is an idea of a “wheel of life”. The idea is that you evaluate different dimensions of your life and plot them on a wheel. Ideally the wheel should be balanced (and as large) as possible. If the wheel is crooked, you know what areas need to be improved to create a better wheel that turns more easily. When the wheel turns more easily, you get better results. In a similar vein, the Software Development Wheel allows you to evaluate your overall software development experience. The tool below can be used by individual developers, the software development team as a whole, or team leaders/managers. To generate your own wheel fill out the form below. Each dimension is rated from 1 (“very little or none”) to 5 (“awesome, doing everything possible”) and descriptions for the dimensions are included below. Be sure to share this page with your fellow developers, team leaders, and management as it’s a great way to start a conversation about how to improve things. More than one person looking at code before it is released. For example: pair programming, code reviews mob programming, etc. Tests than can be (and are) run periodically to check that code is working as expected. For example: unit tests, integrations tests, UI tests, performance tests, security tests, etc. Code from developers is regularly combined together to check that it all works together. Usually automated with a build system/server such as TeamCity, Jenkins, VSTS, etc. Codebase and development teams evolve over time. For example: incremental development, shorter feedback loops, self-organizing/cross-functional teams, etc. Code that is easier to change. For example: readable code, good object oriented practices (SOLID), YAGNI, use of appropriate design patterns, well-named variables/functions/etc. Management exists primarily to remove things that stop/slow down the team delivering the software. For example: shielding the team from management politics, empowering individuals and teams to make decisions, caring about people, providing training, etc. The team has the best tools that are available to do their work. For example, powerful hardware, latest versions of IDEs, multiple monitors, etc. Comfortable work environment. Includes: comfortable ergonomic chairs/desks, standing desks, peace and quiet, air conditioning, plants, cleanliness, etc. The 2018 Stack Overflow Developer Survey was recently released. This article summarizes some interesting points that .NET developers may find interesting, in additional to some other general items of potential interest. C# is the 8th most popular programming language among professional developers at 35.3%. VB.NET is the 18th most popular programming language at 6.9%. .NET Core is the 4th most popular framework among professional developers at 27.2%. SQL Server is the 2nd most used database among professional developers at 41.6%. Windows Desktop or Server is the 2nd most developed-for platform among professional developers at 35.2%. Azure is the 10th most developed-for platform among professional developers at 11.4%. TypeScript is the 4th most loved language at 67%. C# is the 8th most loved language. .NET Core is the 5th most loved framework, the 8th most dreaded framework, and the 5th most wanted framework. SQL Server is the 10th most loved database. Visual Studio Code and Visual Studio are the top two most popular development environments respectively (among all respondents). Professional developers primarily use Windows (49.4%) as their development operating system. F# is associated with the highest salary worldwide, with C# 16th highest. .NET development technologies cluster around C#, Azure, .NET Core, SQL Server etc. 52.7% of developers spend 9-12 hours per day on a computer. 37.4% of developers don’t typically exercise. 93.1% of professional developers identify as male. 74.3% of professional developers identify as white or of European descent. 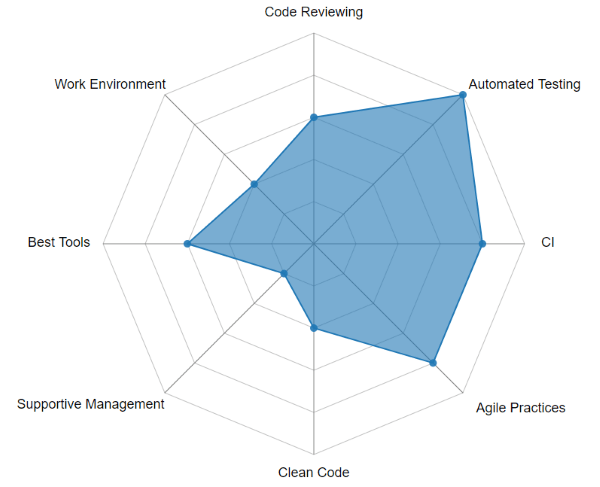 85.9% of professional developers use Agile development methodologies. 88.4% of professional developers use Git for version control. The survey offers a wealth of additional information and you can find the full set of results over at Stack Overflow. In software development we already have the technical debt metaphor that helps describe the the fact that a quick and dirty approach now, may create problems in the future. For example getting a feature into production sooner but compromising the quality/design/testability/etc. may make future changes harder or more costly: hence paying interest over time for the technical debt that was just created. The technical debt metaphor is easily relatable to by non-developers and can help facilitate discussions with business owners/stakeholders. In the real world, paying interest is an acceptable part of life and loans in various forms are not seen as problematic for the majority of people in modern society. Even though they are an essential part of society however, most people dislike the thought of taxes. Would the metaphor of a software development tax provide a more visceral reaction and encourage higher quality software where appropriate? For example, there are “taxes” that come from everyday software development, such as bug fixing or introducing code duplication. Rather than saying “this will add some technical debt to the project…”, we could say “that’s going to increase the amount of tax we have to pay to deliver this…”.